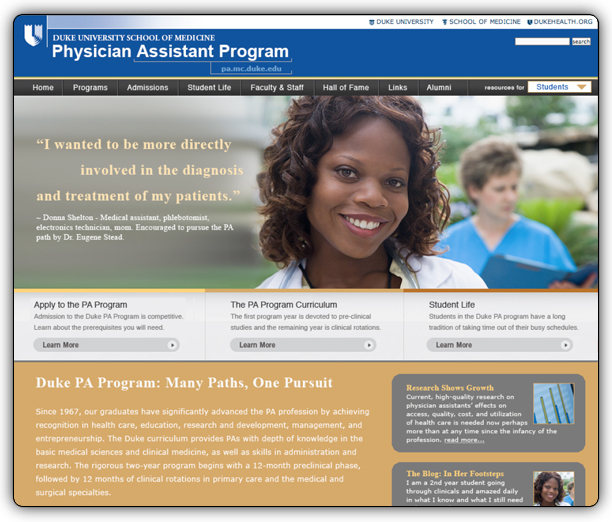 The Duke Physician Assistant web site is the complete source for information about the Duke PA Program and the admissions process. The Duke Physician Assistant Program has a mission is to educate caring, competent primary care physician assistants who practice evidence-based medicine, are leaders in the profession, dedicated to their communities, culturally sensitive, and devoted to positive transformation of the health care system. IONA was called upon to bring the Duke Physician Assistant program mission to the digital environment in a captivating way. 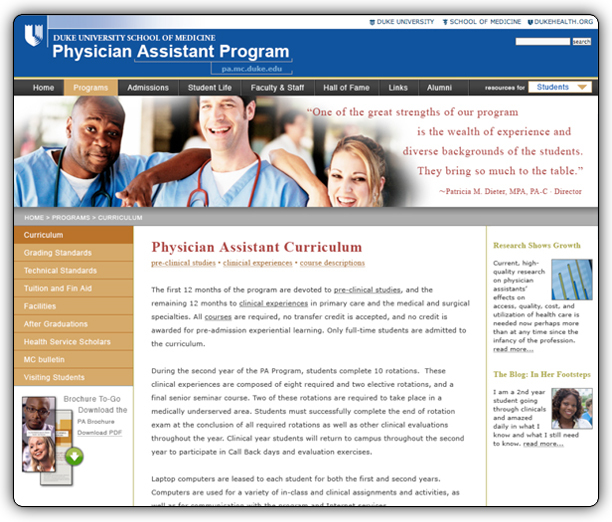 IONA recognized that for many users, the Duke PA web site would be their introduction to the medical school, medical system, and its services. IONA wholeheartedly subscribes to the philosophy that there is only one chance to make a first impression. Hence, we brought in our design and technical team to create a web experience that would help the Duke PA program achieve the goals that have been clearly identified for the project. Digital branding expertise to create an innovative and consistent design that is user-friendly and technologically savvy. Content creation to effectively communicate with user of Duke PA’s program, admissions process, and student experience in an innovative and intuitive way. Development of the digital design and content management system for easy content management.